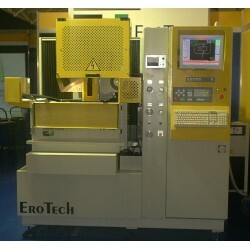 This is a used Hitachi production machine, completely overhauled and refurbished. All worn parts have been replaced; the machine has been repainted and checked in every aspect, so it looks like new. The machine works by sprinkling (water jets) and does not include automatic threading. The separately programmable U-V axes allow you to make regular conic shapes (at constant taper) or different shapes on the XY and UV planes. 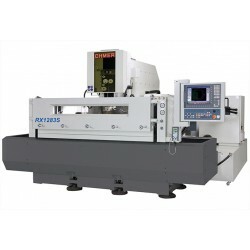 The CNC is Fanuc with the possibility of editing in the background (programming during processing).